Welcome to the 8TH annual bead Soup Blog Hop ! This is my second round of making “soup” from bead ingredients sent to me by a randomly selected partner. We were paired up by master “Chef” Lori Anderson. 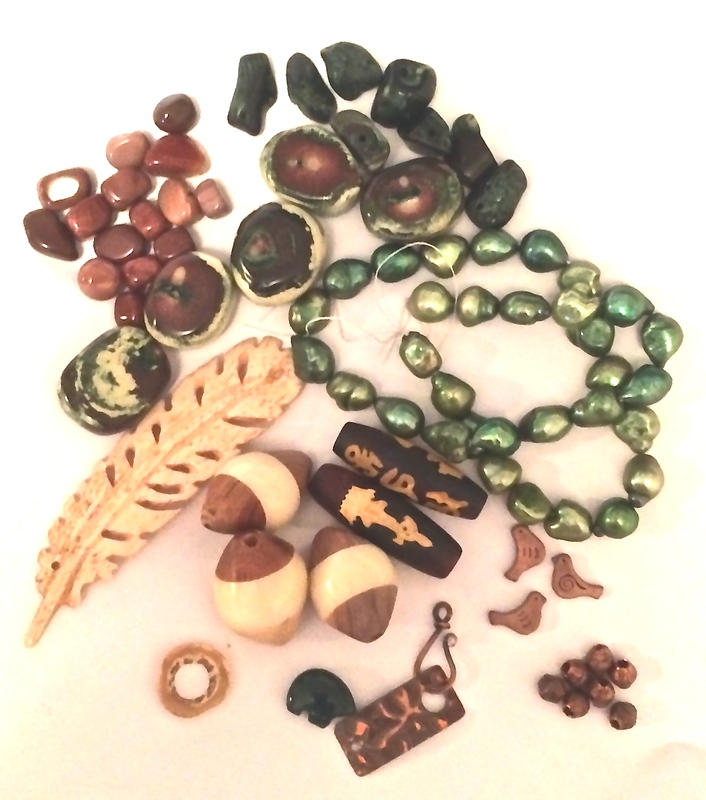 Each person participating gathered an assortment of beads, a focal and a unique clasp. This year participants were encouraged to send a clasp that could be used as a focal in a necklace or bracelet. My partner for BSP this year is Suzann Sladcik Wilson. I sent her an assortment of Dragon’s Blood Coral, Dragon’s Blood Jasper, pink Jasper, green shell pearls, hand carved Agate tube beads, African wood/bone beads, a Tagua nut circle, green Jasper bear, copper birds, hand made copper beads and a clasp from a metal smith local to the West Metro region of Atlanta, Lee Anne Messerschmidt. If you would like to see what Suzann made with the beads I sent her, please visit her at Beadphoria. This year’s ingredients were an interesting mix of beads. There was a strand on beautiful champagne-colourd crystals and some faux pearls ( which unfortunately, were damaged in transit and could not be used), some resin beads that resemble watermelon seeds, onyx beads, some round beads that look like burnt peanut candy (they’re seed pods but I do not know what type), some cream lamp work style beads, 3 silver toggle clasps and a rectangular focal with a time collage embossed on the front. I started with the onyx beads, deciding early to keep it pretty simple. I added some purple crystal drops. Purple being… well have you seen my hair? Ha ! I then made several sweet pairs of earrings. I always enjoy trying to decide if I want to make something classic and refined, cute and fun, bold and a little off-beat or daringly funky. 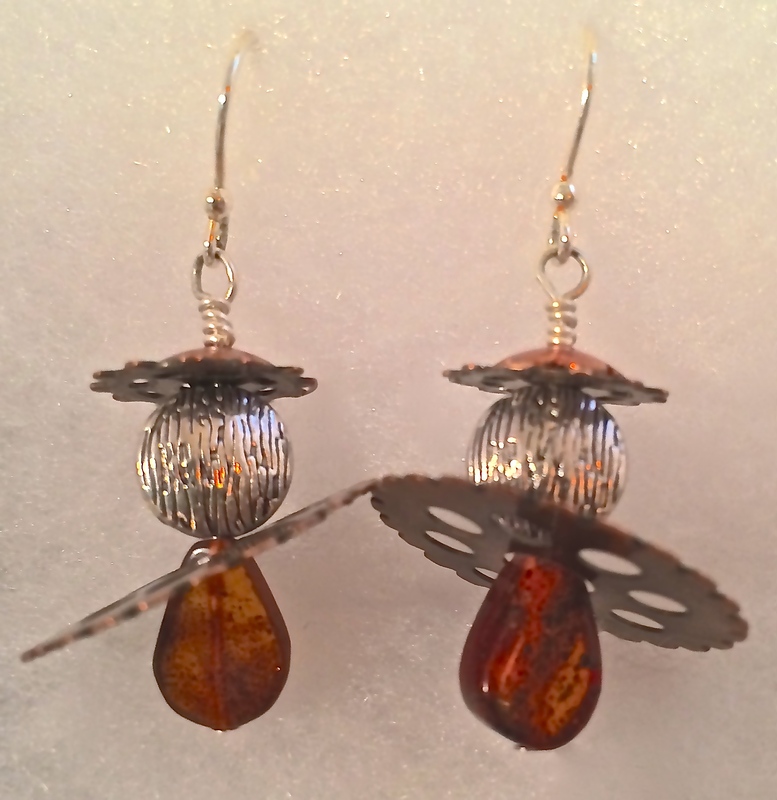 Here are some of the earrings I created for this challenge. Can you guess my favorites ??? 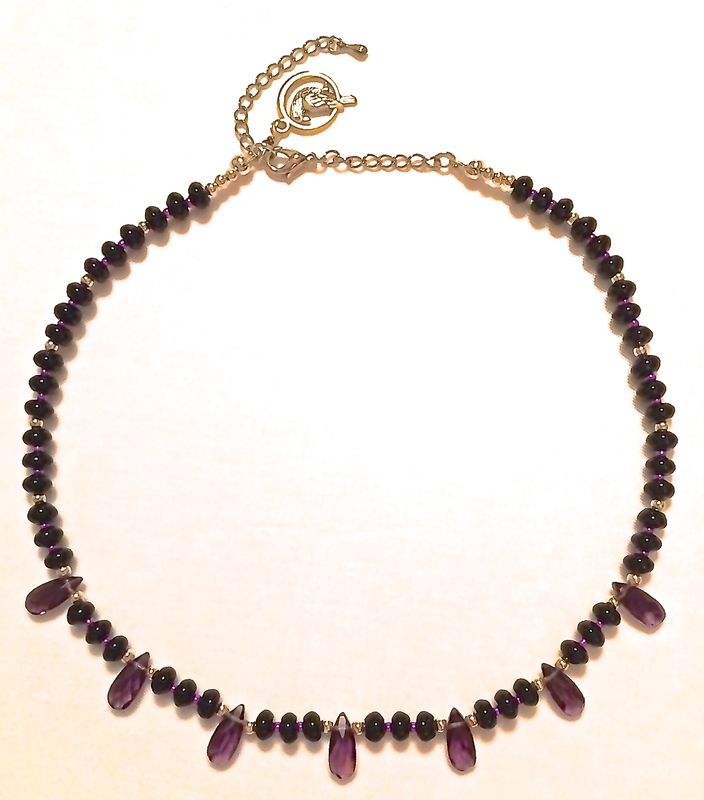 The next item I made was a necklace using the lamp work-style beads. I used a focal from my own collection and added in some wooden beads and the champagne coloured crystals. 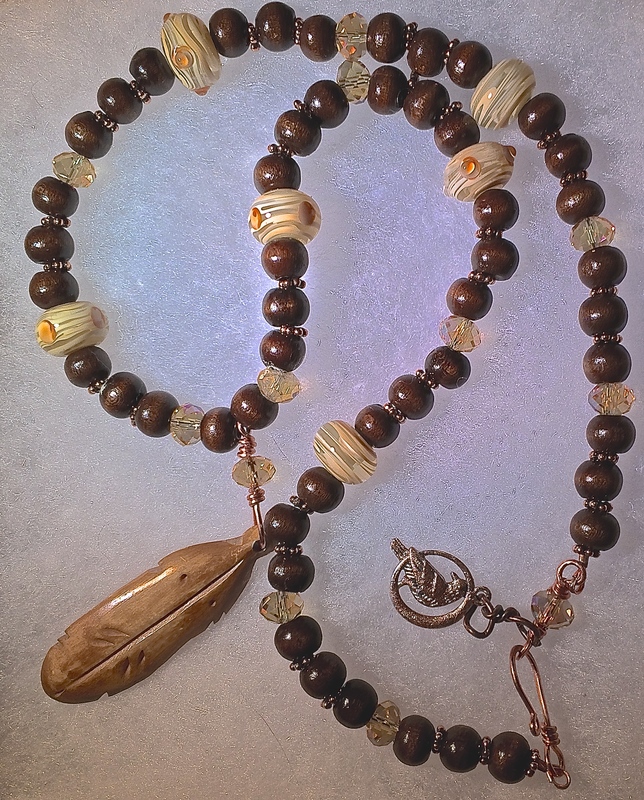 I intended to use some of the seed pods but the necklace went together so easily that I didn’t want to make a change. Now the best (my favorite) piece uses the focal and one of the clasps. I altered the focal by added an infinity charm to continue the time theme. I then started adding other pieces from my collection. I used handcuff charms to attach the charms. At the bottom I added a crow (my Spirit Animal) a fertility Goddess and a hamas. At the top I wired a winged skull. The necklace was beginning to take shape in a way that I like. I had some trouble deciding what to do with the necklace part. I wanted to string some of the beads from the soup, but they didn’t seem bold enough for this “new” pendant. Luckily I found some funky chain that made it all work. I attached one of the clasps I was sent and as always, I added my signature CROW charm. This piece appeals to my funky not-always-so-inner rebel. That’s it for this year’s soup. If you would like to purchase any of thesepieces, visit my shop, CROWS CREATION’S on Zibbet. Please visit the other chefs this year. You can find them here. 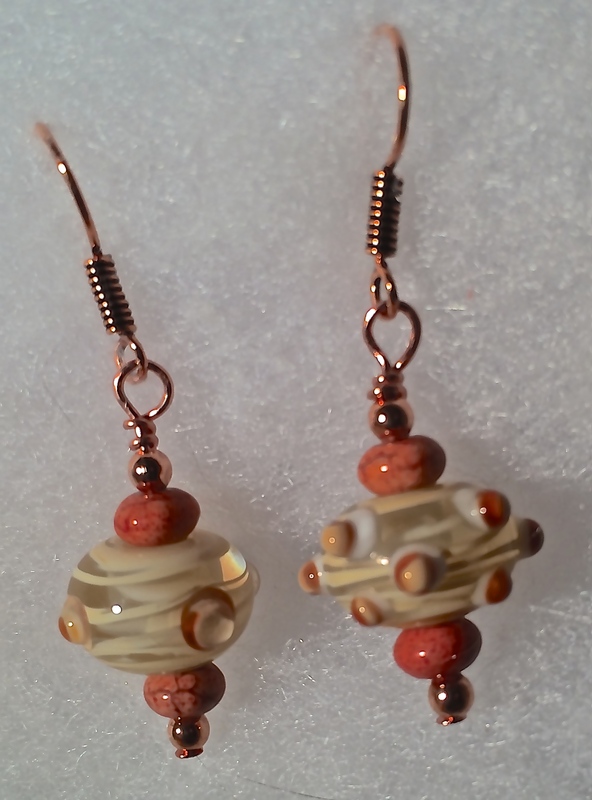 This entry was posted in 8TH Annual Bead Soup Blog Party, Challenges, My Creations and tagged #CrowsCreations, #RAWardsATL, #Stones and Bones Jewelry Design, Atlanta Ga., bone beads, cosmic effect, fashion. Bookmark the permalink. Fabulous pieces. I am especially loving that last necklace design. Beautiful designs. I love how you make all the earrings. Thanks for such great photos. Wow. You went from pretty delicate pieces via sweet angels to full on funky rebel awesomeness complete with winged skull. What a rollercoaster journey!! Incredible!! Thanks so much. I had a lot of fun. I think it’s great that you have so many design styles pulling at you, that way you can make a little something for everyone! And you totally did that with this challenge. Each of your designs has its own personality. Wonderful job!! Hope, thank you so much. I value your opinion. Cool! Love the last 2 especially. How fun! 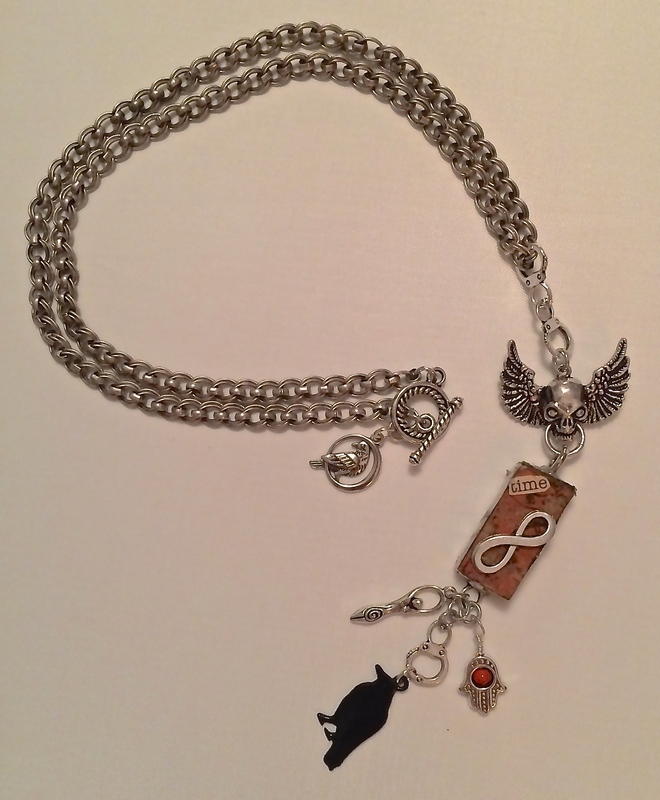 Nice designs, I think the last necklace with the crow is awesome! The Crow is my Spirit Guide so I use her a lot. Thanks so much for taking the time to stop by. What great designs! I love how they all vary so wildly and truly show a wide variety of talents. So many beautiful pieces and the onyx and purple crystals necklace is stunning! Thank You Kumi. I had fun playing in the different corners of my mind. So glad you enjoyed your soup! Kudos on making some outstanding designs! gosh, all those pieces are great! Those earrings are so much fun, I love them all! And I really like that necklace you made with the lampwork beads. All of your pieces are great. I think my favorite is the last necklace. I like how you altered the pendant . Lovely designs. I like the bird charms and your earrings best, but everything is well done. Nice variation in your pieces too. Thank you Kelly. It’s hard to stay inside the lines. I love the earth tones in your soup and how well all of your pieces came together. That last necklace is especially great! Thanks!!!! I had fun playing with the charms. all designs very elegant, but flying scull-absolutely rocks! I like skulls so thank you so much !!! I love the details in your necklace and the very cool earrings. You are a wonderful designer. Corrie, thank you. I enjoy working with my beads. Loved the soup you sent! Was really liking the whole clean lines feel you had going and then a goth charm necklace but not! I love that! And somehow you managed to keep the clean lines feel, wonderfully done!! I loved the soup my partner sent as well Dana. I appreciate your comments and I hope to continue to grow with each project. I believe your mystery seeds might be rudraksha, traditionally strung in Hindu or Buddhist malas (rosaries or prayer beads) and also having medicinal uses. hank you so much Monique. Both for the awesome compliment and the info. That is exactly what my mystery beads are !!! I found the first necklace very pleasing in the simplicity of its design, and i like all the earrings and liked the way you used metal in the third pair, but I’m guessing your favorite was the middle pair? Thank you Sheila. Actually, my favorite pair is the last one. The one with the cogs. 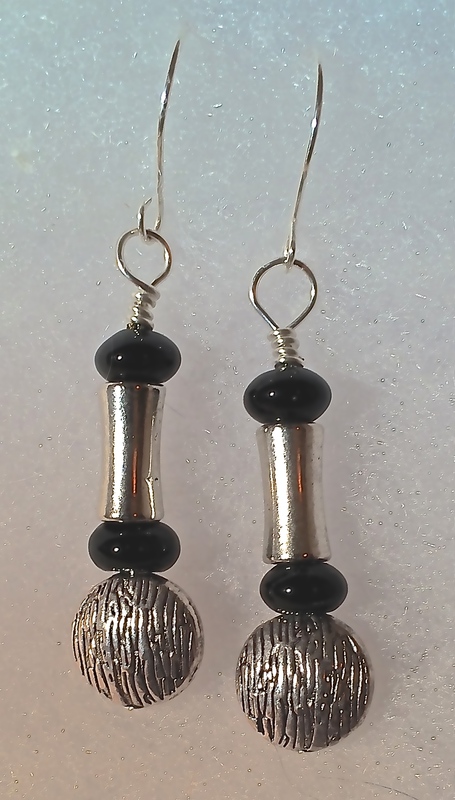 love your black silver earrings. 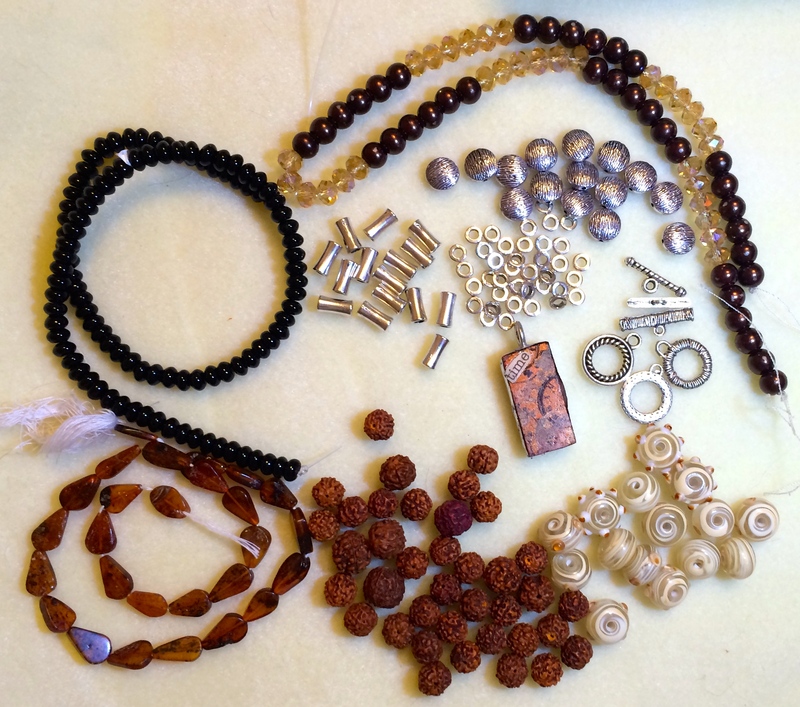 And yes, just like Monique said – those are rudraksha beads used traditionally for malas. Great pieces. 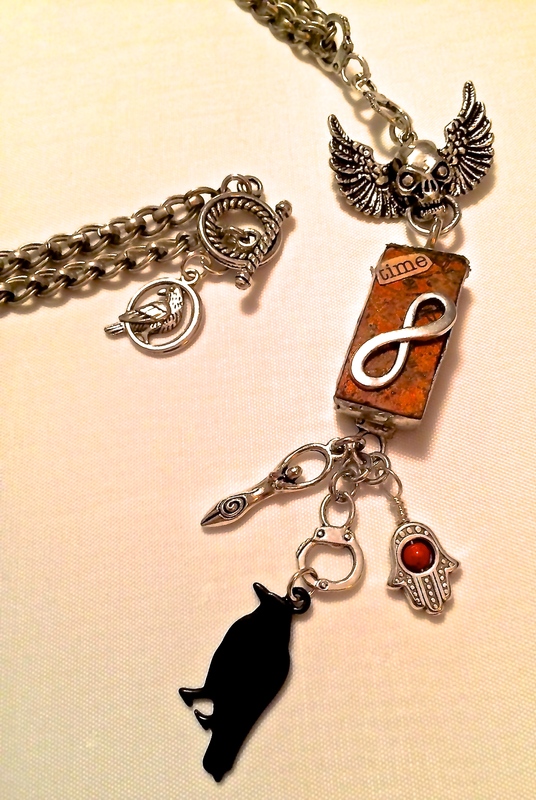 The charm necklace with the infinite time pendant is fabulous. Thank you so much. I enjoyed making it. Pretty Pretty Pretty. Love all the earrings. Love the onyx and purple necklace. The last necklace is very unique and cool!!! Have a Blessed Day! Thank you for stopping by. I had a lot of fun making everything. My fav is the onyx with the purple drops. Great work. Beautiful reveal. Love the long pendant look of the second necklace. Great job. Beautiful pieces, love those earrings! I believe we all know the value of subtlety but it’s the funky pieces that are the most challenging. I really like the chain necklace with the focal that incorporates so many symbolic items! Gorgeous work! Really Soup-er! Yep I’m still hopping! Don’t want to miss a thing! I don’t know why it hit me, but that chain is awesome! You did a great job. I’m sorry it’s been so long me getting around to see everyone!